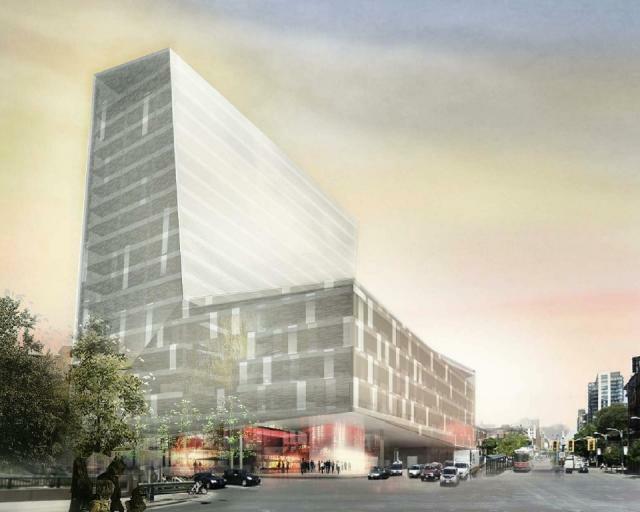 The Globe and Mail is pleased to announce that plans are underway for its new headquarters, scheduled to open in late 2015. The 480,000 sq. ft. building will be located at the north-west corner of Front Street and Spadina Avenue. Its design will create an inspiring work environment and help maintain The Globe's lead as a news organization. "As The Globe's business continues to evolve, and we explore new ways of connecting with our audiences, this building will play an important role in engaging our people and articulating our brand value," said Phillip Crawley, Publisher and CEO of The Globe and Mail. "The dynamic building will be a town square of 21st century Canadian media: a home for great journalism, and exceptional and diverse business talent," said John Stackhouse, Globe and Mail editor-in-chief. "For The Globe and Mail, an interactive, open and fluid newsroom is critical to the endeavour of journalism and digital innovation." Kuwabara Payne McKenna Blumberg Architects (KPMB) has been selected to create this new landmark building. It will be an eighteen-story multi-tenant building, linking to a six-story podium that will house The Globe and Mail. The building is being designed to LEED Gold standards and integrates leading edge sustainable and green building design principles. "The architecture works from the inside out and the outside in to create a world stage for The Globe brand and symbolize the significant role the news plays in our daily lives. The design forms a recognizable gateway into Toronto and creates a lively 'go to' place, in a rapidly transforming neighbourhood. The collaborative interior environment will inspire and support The Globe's people in bringing quality journalism to Canadians," said Marianne McKenna, partner, KPMB Architects.